Course Website: Official Website - Visit Bayonne Golf Club's official website by clicking on the link provided. Accolades: Ranked 2nd in New Jersey on Golf Course Gurus' Best in State list. 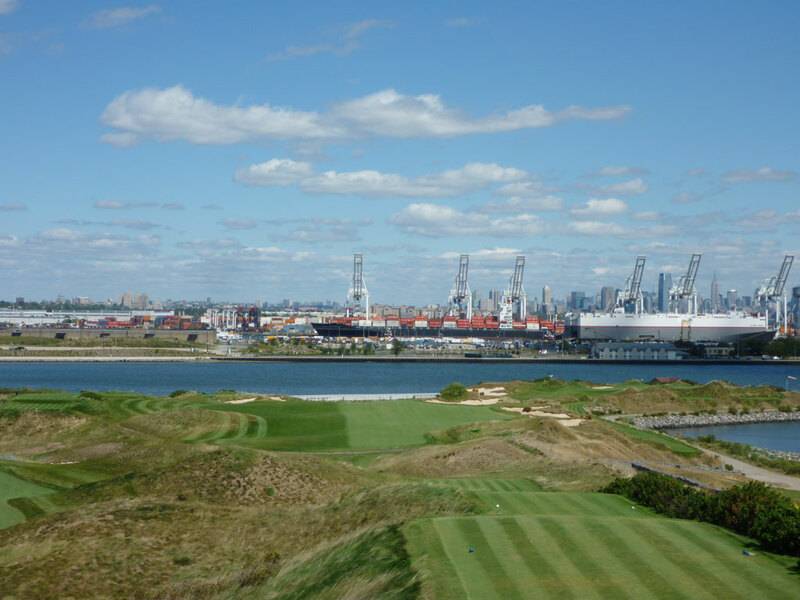 What to Expect: Simply put, Bayonne is an engineering masterpiece. 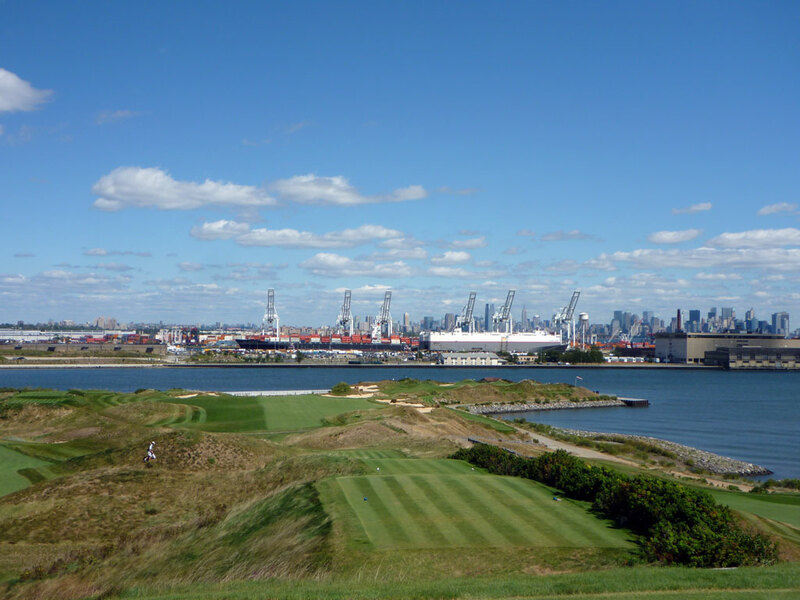 The course was created when sludge from the New York Harbor was piled up on an old landfill. 7.5 million cubic yards of harbor waste was spread out over 140 acres of land and now features nearly 100 feet of elevation change on a property that used to have less than 10. 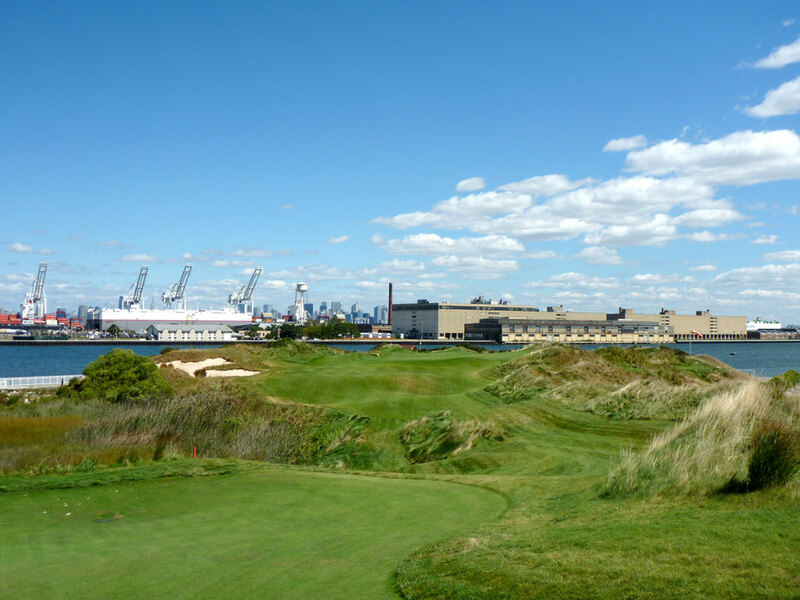 Urban and industrial views are afforded from the high spots on the course while an intimate links feel is offered while walking through the hillocks and fescue. The course features a great variety in hole lengths, shapes, and elevations and features classic holes such as Redan and Cape. 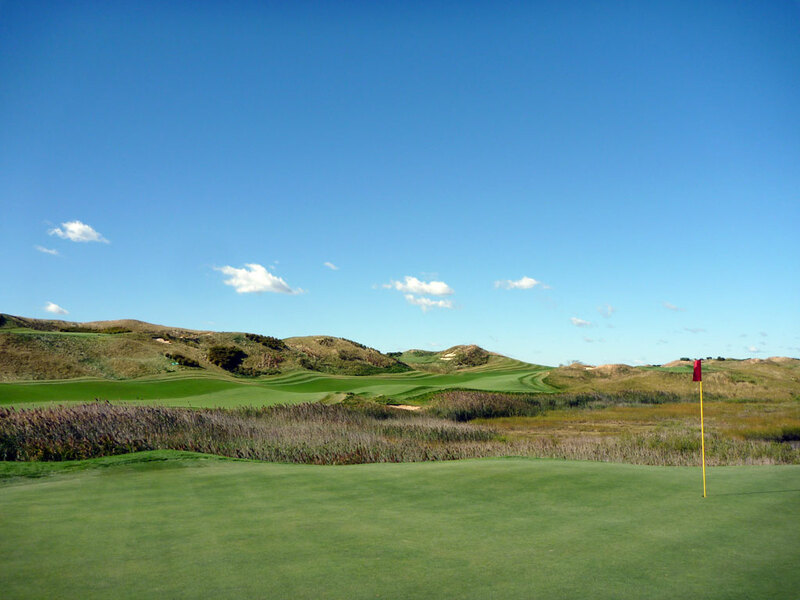 The final five holes start right next to the clubhouse and takes the golfer on one of the most impressive stretches of finishing holes in the country. Speaking of clubhouses, the iconic building overlooking the course boasts high-end finishes and expansive harbor views. Outside of the clubhouse features a massive flag pole that hosts the second largest American flag on the east coast. 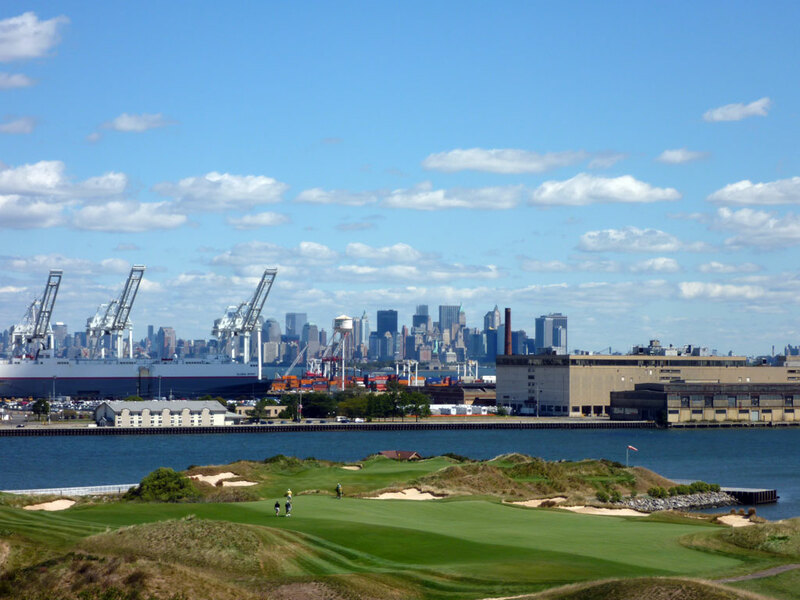 In conclusion, the walking-only course at Bayonne is both impressive and highly unique due to having a true links feel while featuring urban and industrial views all around; including glimpses of Lady Liberty. 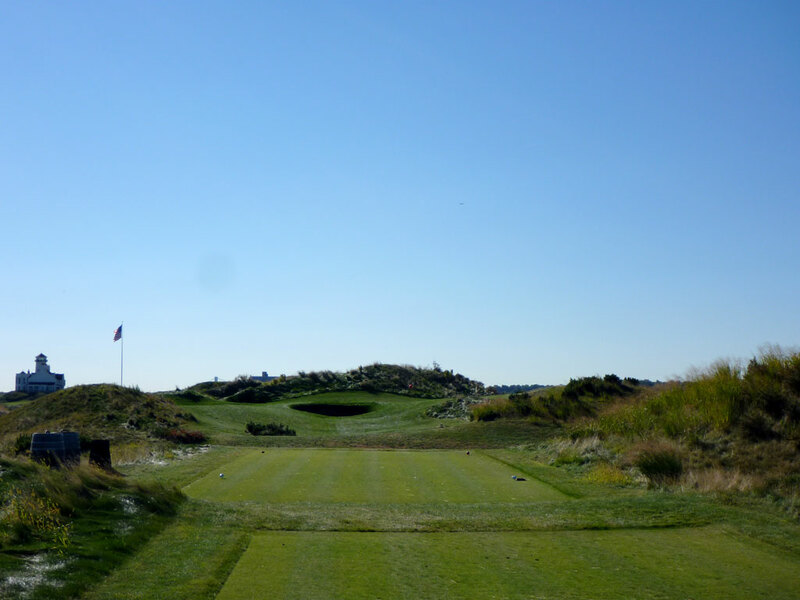 Signature Hole: 16th Hole – 486 Yard Par 4 – The engineering masterpiece known as Bayonne Golf Club features some stunning links inspired holes, but none quite so captivating as the long down hill 16th with Lady Liberty holding her torch in the background. Descending downhill from near the clubhouse, the hole features a fairway that gradually tightens and begins turning slightly right the closer to the green you get. The relatively narrow and deep green features some distinct shelves and is tucked between bunkers that seem to stare with intimidation back at the golfer as he prepares his approach shot. 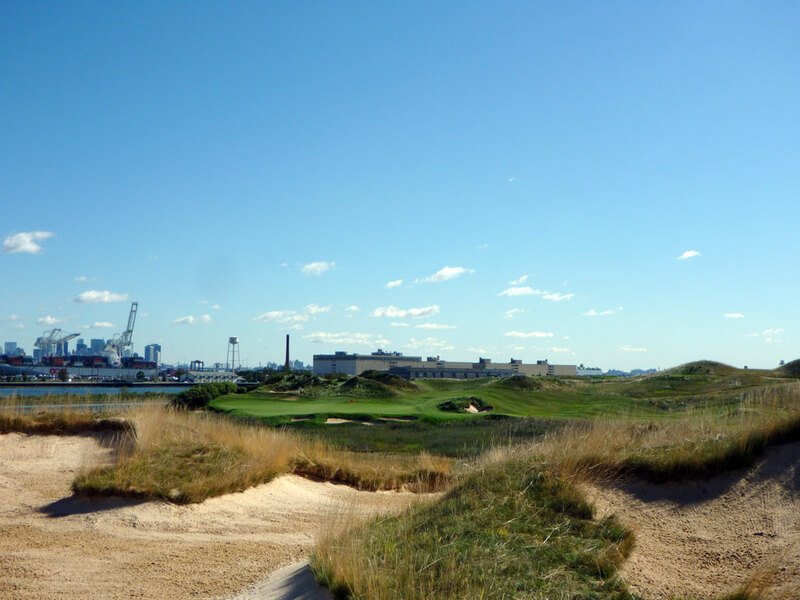 With the harbor and New York as your background, this hole is stunning both visually and architecturally. 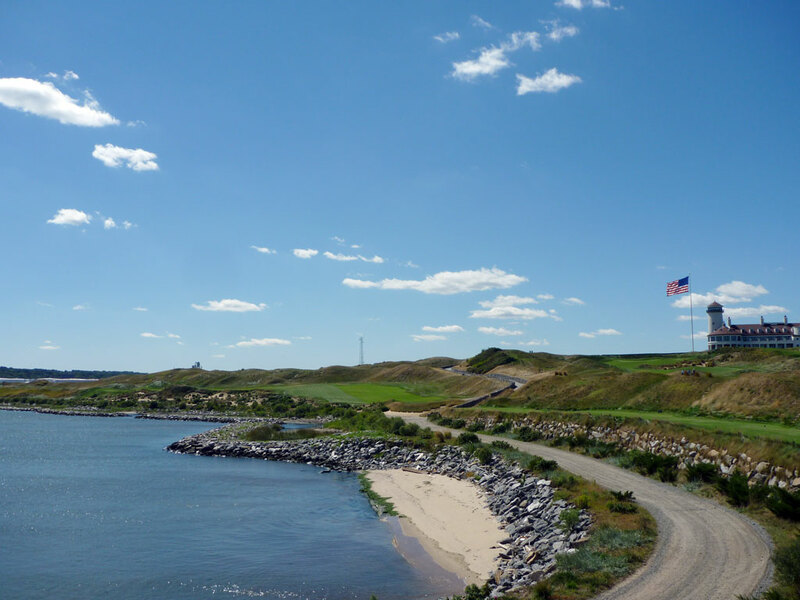 Best Par 3: 14th Hole – 222 Yards – With Bayonne's highly impressive lighthouse inspired clubhouse looming behind you, you must prepare yourself to tackle on Bayonne's beautiful 14th hole. Playing 40+ feet downhill, the far left side of the green isn't visable from the tee and can add additional drama when challenging that portion of the hole. 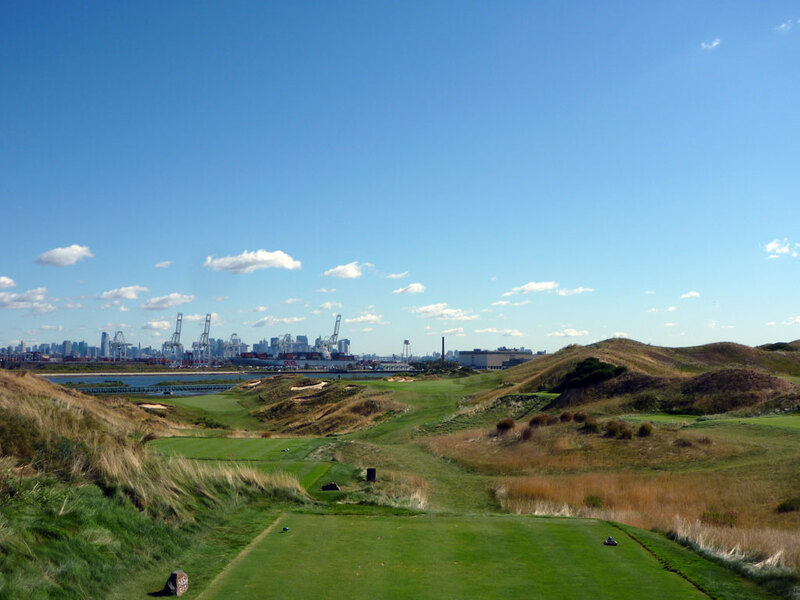 The Statue of Liberty is visible from the tee, though she can sometimes be difficult to spot given all of the other buildings that share the background. It is a very exciting hole and the start of a brilliant set of finishing holes. Best Par 4: 17th Hole – 491 Yards – Originally this hole was planned as a par five, but due to some environmental restrictions, the 17th hole became a brilliant cape hole that is a formidable challenge as you begin your ascent back to the home green. The hole capes right-to-left and features an expansive bunker between the water and the fairway and is peppered with bushes and foliage that can gobble up a ball in a hurry if a tee shot heads wayward left. This hole also marks the start of a quick ascension from the coastline up nearly 100 feet to the clubhouse. 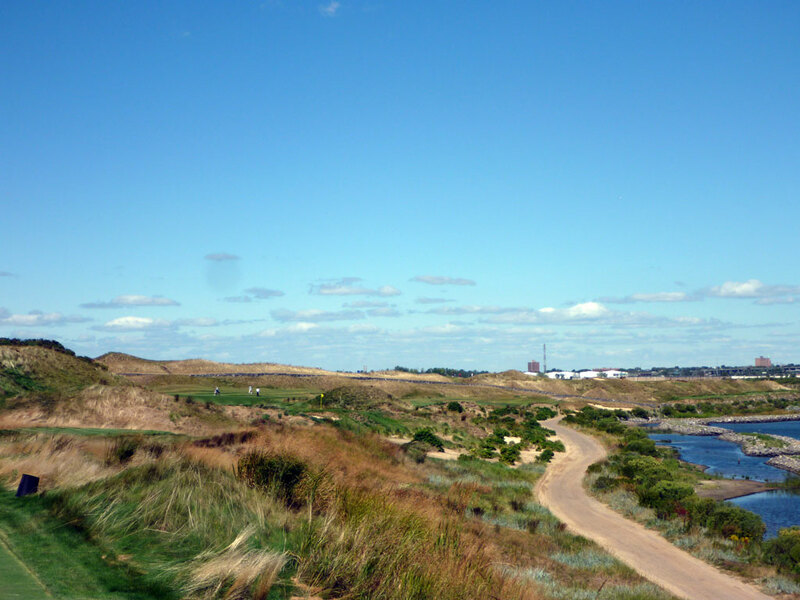 Best Par 5: 8th Hole – 579 Yards – The 8th hole runs parallel to the 2nd fairway for a portion of the hole and then continues downhill towards the harbor. A solid drive will setup the possibility of reaching this green in two by requiring n exhilarating, long carry over a marsh to a peninsula green. Alternatively, golfers are afforded the option of following the fairway out and to the right of the marsh where plenty of fairway awaits to accommodate the less heroic approach. The green is quite large and deep to accommodate long approaches into the putting surface from the fairway above. Birdie Time: 5th Hole – 146 Yard Par 3 – Sub-150 yard holes are great opportunities to score under par. The golfer generally has a club in their hand they have confidence in, the lie is perfect, and the distance in manageable. 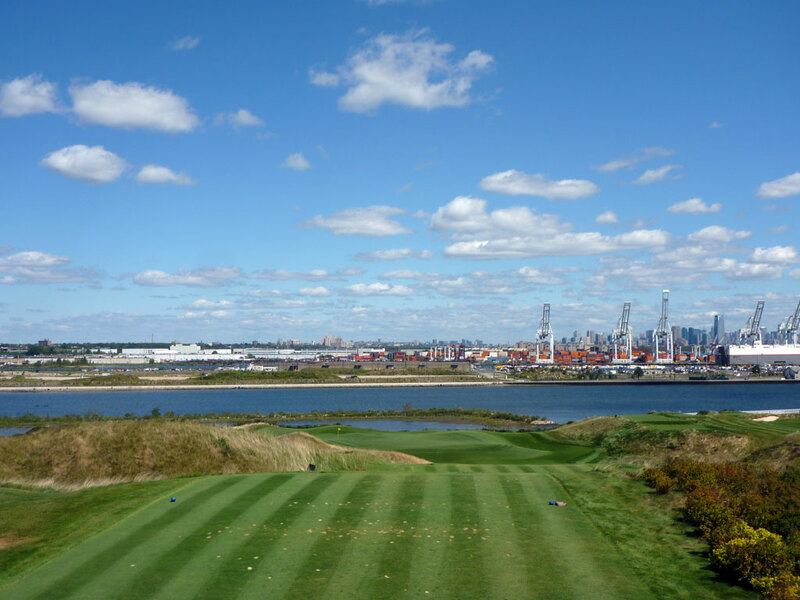 That opportunity is afforded at Bayonne's 5th hole where a short uphill par three is presented to the golfer. Although some trouble exists around the putting surface, this is a great chance to card a birdie. 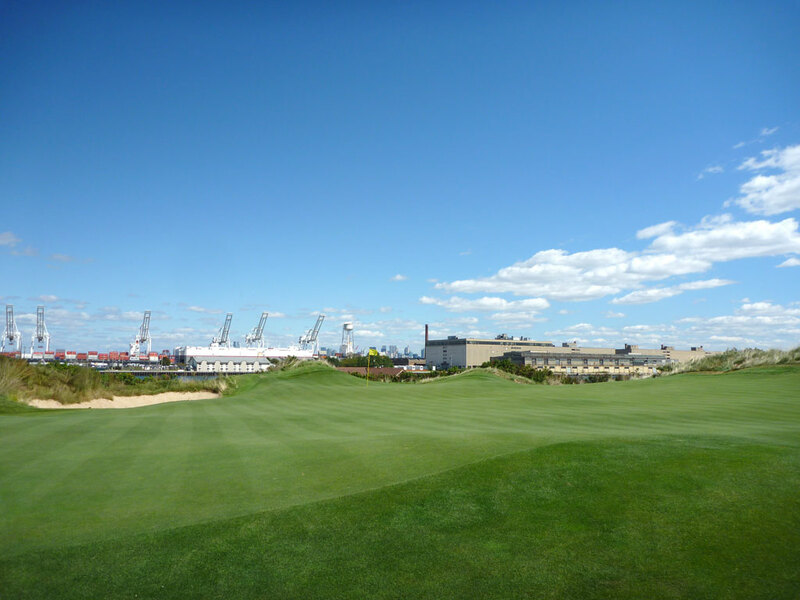 Bogey Beware: 16th Hole – 486 Yard Par 4 – Bayonne's signature hole is also it's most difficult. Playing well downhill provides the opportunity to generate extra length off the tee, but is also will amplify any mistakes in accuracy. Missing the fairway nearly guarantees a bogey and hitting the fairway hardly guarantees par. The hole greatly narrows towards the putting surface as bunkers and undulations encroach from each side and lure in the golfer's mind. At nearly 500 yards, the distance is stout enough. But factor in the challenging circumstances and the often windy conditions and you find yourself begging for a par.